The Everett Branch of The Mountaineers is sad to announce the passing of Phyllis Nelson on October 2, 2018. Phyllis joined The Mountaineers in 1994 and she will be remembered for her love of music and the out of doors. The Everett Branch of The Mountaineers is sad to announce the passing of Phyllis Nelson on October 2, 2018. Phyllis was born July 19, 1947 in California. She grew up in the Bay Area and attended San Jose State University where she studied music (piano performance) and art. Phyllis joined The Mountaineers in 1994. She will be remembered for her love of music and the out of doors. 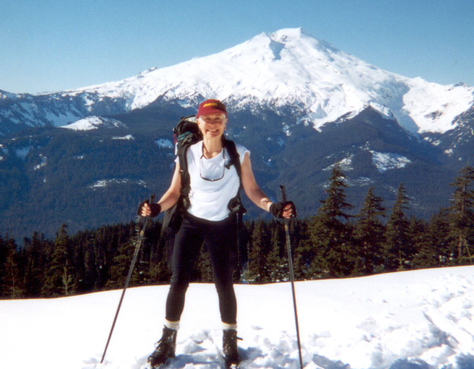 She was an avid skier, hiker, backpacker, cyclist, snowshoer, and scrambler. She constantly looked to improve her life through learning new things and taking on new challenges. Phyllis graduated from the Alpine Scrambling, Avalanche, and Cross Country Ski courses. She also earned Mountaineers Badges for Introduction to the Natural World and Naturalist Study. She volunteered as an instructor for the Scramble and Ski courses, she served on the Ski and Banquet Committees, and she volunteered for several years with the Lookout and Trail Committee’s Meadow Restoration projects. She also won the Lookout Peak award and several mileage awards. She served for a year as branch secretary. Phyllis was also an avid runner, oftentimes placing first in her age division. She ran the Boston and Chicago marathons multiple times, as well as the Seattle marathon, trail races and ultras. She was a nationally ranked master runner and often had her name listed in NW Runner Magazine in their Best Times editions. She ran races almost every weekend, and even had two races marked on her calendar for October that she didn't get a chance to run. She was a talented pianist, artist, and scientific illustrator. She taught piano for almost 50 years. Some of us will always remember her incredible courage and determination to fight for her health through rounds of chemotherapy. She taught us to identify alpine flowers, and was a fierce competitor in blueberry picking competitions on Tonga Ridge. We’ll miss her. Please email Carrie Strandell at cwstrandell@gmail.com for additional inquiries.